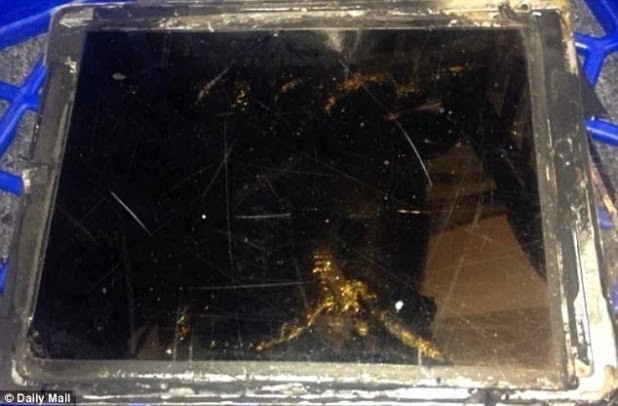 TECHNOLOGY: iPad Air EXPLODES, is it safe to buy this thin BOMB ! iPad Air EXPLODES, is it safe to buy this thin BOMB ! A brand new iPad Air exploded in flames in an Australian mobile phone store.The explosion and fire were so severe that the fire brigade had to be called in to fight the smoke and sparks that were continuing to burst out from the device. The incident occurred in a Vodafone store in Canberra and the shop had to be evacuated. A Vodafone spokesperson confirmed that a “burst of flames” shot out of the iPad Air’s charging port while tablet was sitting unused. Sparks and smoke reportedly then continued to billow out of the device and the store was evacuated. The iPad apparently continued to burn until the fire department arrived to extinguish the blaze. No comment has been available from Apple, which released the dramatically thin new model with the claim that it created an entirely new mobile computing experience. With its thinner appearance, lighter weight and faster processor than the earlier model, it has been received favourably by technology writers. Samsung Smartphones have taken over the world ! LG's G Flex can be bent!